They say Tyrannosaurus rex – “king of the tyrant lizards” – roamed throughout what is now western North America from around 67 million to 65 million years ago, when the Cretaceous-Paleogene extinction event wiped out the land-dwelling dinosaurs. Well, “they” are wrong, because a T. rex was spotted this morning in Victoria, BC, scaring the bejesus out of the people and the peacocks puttering about in Beacon Hill Park. One of the largest carnivorous dinosaurs ever to live, the T. rex of old measured up to 40 feet (12.3 m) long. Pfft. That’s nothing. Victoria’s T. rex is just shy of seven kilometres from nose to tail! 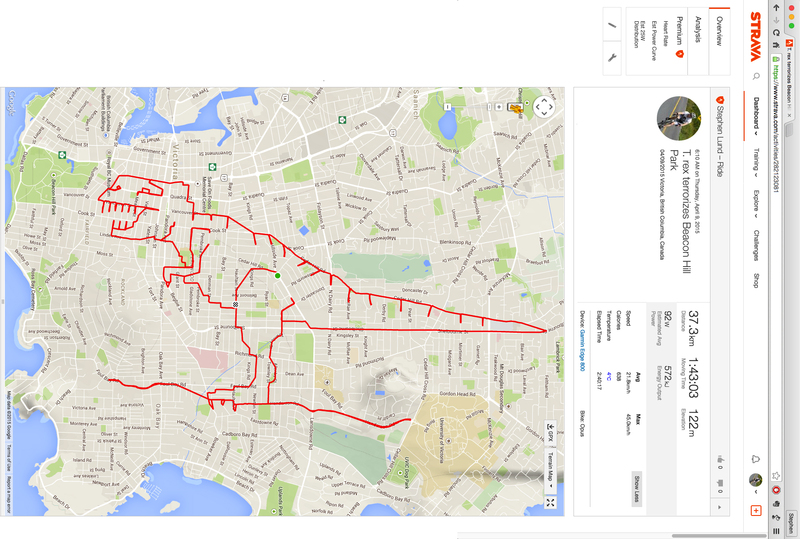 This entry was posted in gps art and tagged Beacon Hill Park, creativity, cycling, dinosaurs, garmin, gps, gps art, strava, strava art, T. rex, Tyrannosaurus rex, victoria bc. Bookmark the permalink. T. rex is always a crowd-pleaser! Very cool idea. Love your work! Thanks, Preston. Thrilled to hear it!